In 2011, the National Civic Art Society launched and led a six-year campaign to stop Frank Gehry’s atrocious, gargantuan design for the National Eisenhower Memorial, which is to be located in Washington, D.C. But for NCAS’s campaign, the memorial was flying under the radar and was a fait accompli. The Society brought the design to national and congressional attention. As a result of NCAS’s efforts, Congress halted all funding for years, and Gehry was forced to remove one of the most notorious features of the design: a statue of Eisenhower as a life-size barefoot boy seated on a plank. Gehry was also forced to shrink the size of the memorial, removing pieces of it that were as large as two basketball courts. The pieces had been blocking the viewshed to the Capitol building. 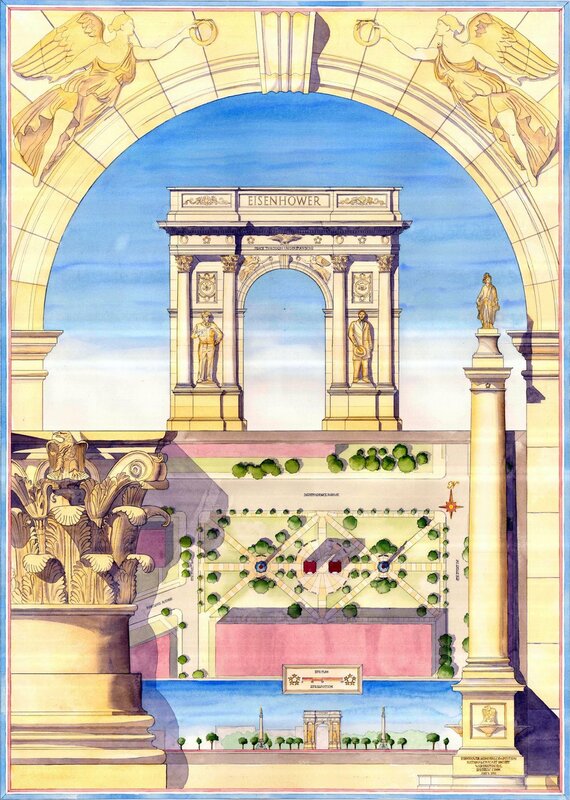 The National Civic Art Society twice testified in the U.S. House of Representatives about the memorial, and published numerous articles about it. NCAS also put on numerous events and held a counter-competition for a classical alternative to Gehry’s design. For a RealClearPolitics article on the National Civic Art Society's campaign, see here. On June 6, 2011, at the Rayburn House Office Building in Washington, D.C., the National Civic Art Society and Institute for Classical Architecture & Art Mid-Atlantic Chapter held an award ceremony for the Eisenhower Memorial Counterproposal Competition, which was created in response to Frank Gehry's ugly, deconstructionist proposal. Susan Eisenhower, the President’s granddaughter, delivered remarks. On July 18, 2014, at the U.S. House Rayburn Office Building in Washington, D.C., the National Civic Art Society hosted a briefing to discuss the current state of the Memorial and its future prospects. The panel concluded that the design appeared to be dead, and advocated for a new, open competition. Bob Dole Is Wrong: The Eisenhower Memorial Needs to Be Right, Not Rushed." "Opposition to Gehry's Controversial Eisenhower Memorial Is Clearly Bipartisan." 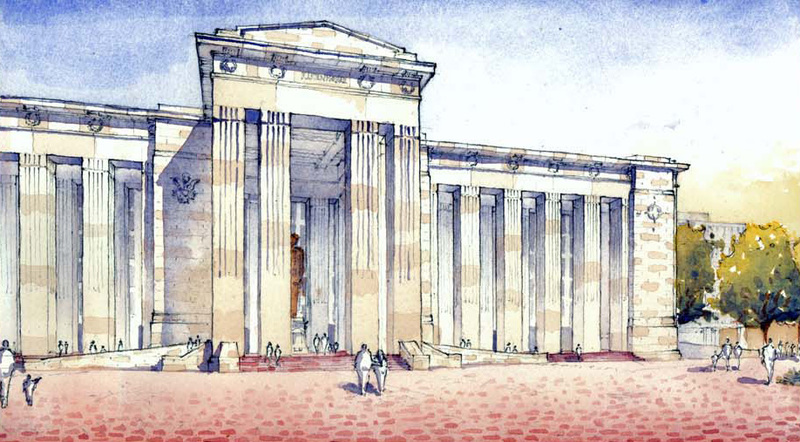 "It's Time to Bury Frank Gehry's Eisenhower Memorial." "Why Congress Should Support a New Eisenhower Memorial." "Let's Not Politicize the Eisenhower Memorial." "Frank Gehry's 'Eisen Curtain' Must Not Descend Upon the National Mall."